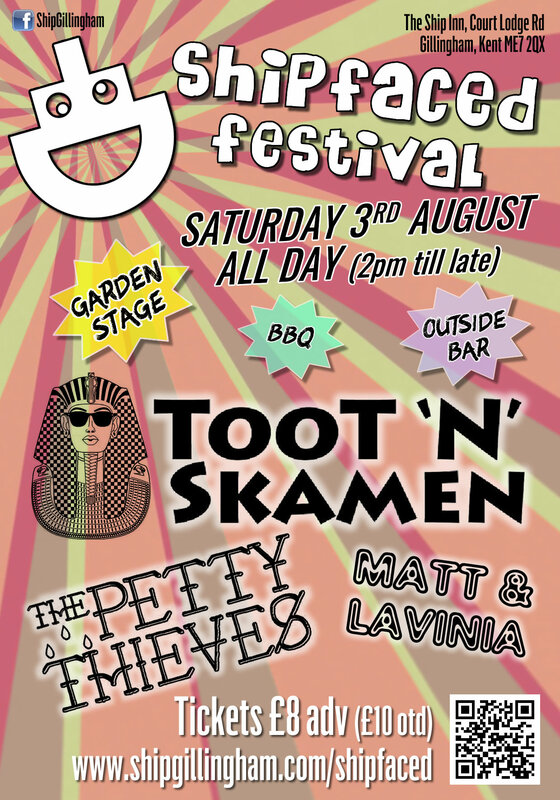 TOOT 'N' SKAMEN - the finest ska band in the country, playing all your favourites from The Specials, Madness, The Beat, The Selector, Desmond Dekker, Toots & The Maytals, Prince Buster and many more! THE PETTY THIEVES - sleazy reggae/ska/funk originals from the dirty streets of the Medway towns. This band are one the way up and are gonna be huge. Check them out! MATT & LAVINIA - superbly performed covers of all-time classic grooves covering Motown, soul, R&B, jazz, blues and contemporary pop. Tickets will not be sent out in advance - they must be collected in person at The Ship on the day of the event. Please bring proof of purchase/ID when you come (eg. print-out of confirmation email). Sorry, we are unable to issue refunds. Please note: The 'Buy Now' button will take you to a secure payment page on the PayPal website where your order will be processed. Once your order is complete you will receive a confirmation email from PayPal. Please allow a few minutes for this to arrive.